Charles R. Sheeler (American, 1883–1965), Mandarin, 1912. Oil on panel, 10 × 13¾ in. (25.4 × 34.9 cm). Munson-Williams-Proctor Arts Institute, Utica, N.Y. The critic Charles H. Caffin recognized the “influences of foreign movement(s)” upon Sheeler’s work. But he received no additional notice, and none of his pictures sold. Nonetheless, the Armory Show was a formative experience for Sheeler. He called it “the great eye opener” that reaffirmed his commitment to modernism, giving “the green light that it was all right to exhibit pictures like that.”  The exhibition inspired him to produce some of the most abstract paintings of his career. Carol Troyen and Erica E. Hirshler, Charles Sheeler: Paintings and Drawings (Boston: Little, Brown and Co., 1987), 5. Martin Friedman, Charles Sheeler (New York: Watson-Guptill Publications, 1975), 20. 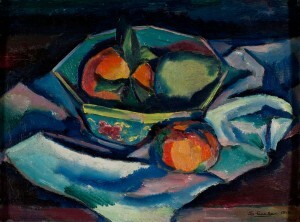 There has been speculation that he also exhibited Still Life- Spanish Shawl (1912) because an inscription in Sheeler’s hand, on the stretcher of the painting, reads, “this picture was in the Armory Show/1913/Charles Sheeler.” Troyen and Hirshler, 44, n. 24. Milton Brown, The Story of the Armory Show (New York: Abbeville Press, 1988), 90. See also Kuhn Papers, Archives of American Art, Smithsonian Institution, Series 1: Armory Show Records, 1912-1963, 1.2 Domestic Art Committee Records, 1913, Box 1, Folder 75, Record Book 1913, p. 28. Charles H. Caffin, “International Still Stirs the Public,” New York American, March 10, 1913, 8. Oral history interview with Charles Sheeler, December 9, 1958. Archives of American Art, Smithsonian Institution. Carol Troyen and Erica E. Hirshler, Charles Sheeler: Paintings and Drawings (Boston: Little, Brown and Co., 1987), 2-3. Ibid, 4. He exhibited at the PAFA annual exhibitions in 1907, 1908, 1909 and 1910. In 1908 Sheeler had his first solo exhibition at the McClees Gallery in Philadelphia and exhibited at the National Academy of Design. New York dealer William Macbeth also showed Sheeler’s work in 1908 and 1909. Ibid., 4. Sheeler frequented Parisian galleries that promoted avant-garde painting, including Bernheim-Jeune, Druet and Notre-Dame-des-Champs and had the opportunity to see Michael Stein’s collection. Sheeler Papers, Archives of American Art, Smithsonian Institution, Washington, D.C., microfilm reel NShl, frames 62-64. Macbeth to Sheeler, quoted in Garnett McCoy, “Charles Sheeler: Some Early Documents and a Reminiscence,” Journal of the Archives of American Art 5 (April 1965): 2.